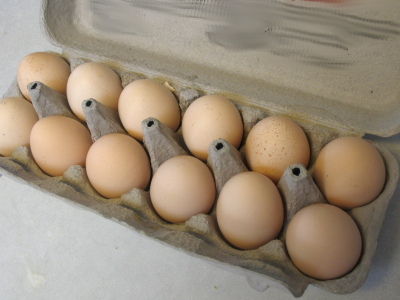 On the advice of my mother, I decided that first batch of eggs that came from my new chickens were going to be given to God. Sort of a first-fruits offering, reminiscent of Old Testament offerings of thanksgiving. 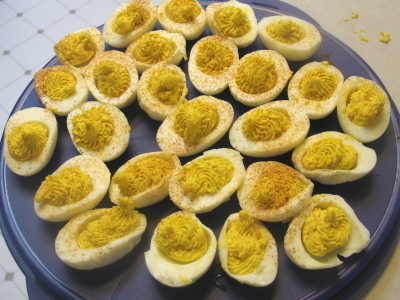 I asked my pastor how he thought the eggs could be given to God, and he recommended whipping up a batch of deviled-eggs and bringing them to the next Sunday Service. Deviled eggs. At church. Oh, what a joker my pastor is. But I did it anyway, and they turned out great. Here's an interesting comparison of the difference between a "range-free organic" chicken from Safeway, and one from my chickens. Mine is the one on the left. It's darker, denser, less crumbly, and better in every way. Interesting, but you still have not clipped those nails. Congrats on the happy chickens and the deviled eggs! I complete support your mothers wisdom. That is one weeks growth? Holy cow...err shall I say Holy Chicken thats a lot of growth for one week. Vitamins? 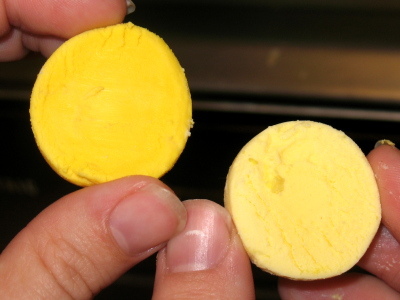 The difference in yolk quality looks substantial. The taste?